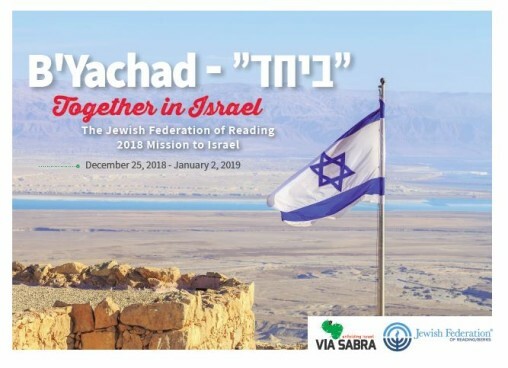 B'Yachad Together in Israel | Jewish Federation of Reading Pa., Inc. The Jewish Federation of Reading is excited to invite you to our 2018 mission tour to Israel. Join us in celebrating Israel's 70th anniversary year. The mission departs December 25, 2018 and returns January 2nd, 2019. We will enjoy and learn about Israel - its people, its beauty, its accomplishments and issues. We welcome all our community members to take part: families, single adults, seniors and others. A Street Art Graffiti Tour in Tel Aviv's Florentine neighborhood. Rosh Hanikrah Israel's stunning chalk-white cliffs at its northernmost coastal border. Exploration of the Jewish Quarter of the Old City and Western Wall Tunnels. Costs: the Jewish Federation of Reading will subsidize $500 per participant.